On Saturday, state water regulators issued a revised plan based on Governor Jerry Brown's April 1 mandate that everyone statewide cut back on water usage by 25 percent. The new plan takes into account various factors among the hundreds of effected local water agencies, including those that are relatively water rich, those that are considered urban but still divert a large percentage of water to agriculture, and those that have already shown themselves to be better at conservation. In the new tier system, San Francisco's is among the 23 local agencies allowed the most lenient restriction goal of 8 percent. Regulators have also added a "carrot" for agencies who continue to be good examples in terms of conservation: If an agency exceeds their conservation goal they could become eligible to graduate to a reserved 4-percent tier, with the least amount of restriction. Currently that tier is empty. As KQED reports, regulators are also sensitive to the "distracting and incorrect soundbites" circulating in the media about agricultural water usage and the perception that the state was giving farmers a "free pass." Water board chair Felicia Marcus is defensive in saying that California's farm belt is facing tighter restrictions, but it's being done via other mechanisms. As she explained recently to the LA Times, the idea that farmers' are consistently taking more than their share is "more perception than reality"  though she does not address the problem raised by many critics that Central Valley agriculture has been over-tapping groundwater reserves and threatening the environment in that way. But this gets into the issue of "water rights," and what are known as junior and senior level rights to state-controlled water, when it comes to farming. The reality is that entitlement to water is conditional. It depends on how much is flowing. When a river is running low, a farmer with junior rights is not going to be allowed to draw out much. But the water board soon will also begin crimping growers with senior and riparian rights. "Water rights holders do understand," Marcus says, "although their understanding may be different than the rhetoric they put out there." But getting back to the newly revised restriction tiers, which were based on several hundred comments, other communities that are facing fewer usage restrictions include some small towns on the North Coast that currently have no shortage of water reserves, and utilities that have fewer than 3,000 water connections/customers. The largest number of agencies statewide, 94, are assigned to the strictest tier, where a 36-percent cutback will be required. 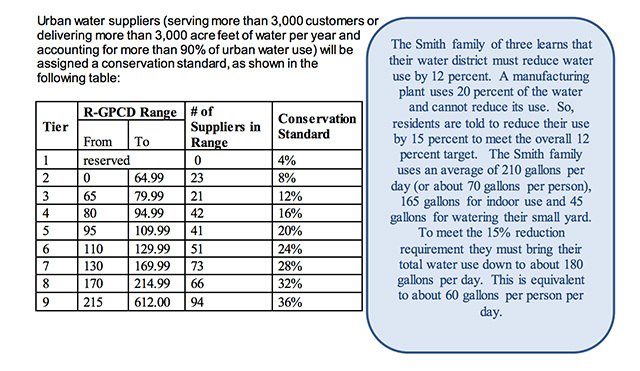 The water board reminds us, too, "In many communities around the state, over half (and up to 80 percent) of total residential water use is for outdoor irrigation during the summer months." And that can not continue. Compliance assessment (i.e. the crackdown on cities that are ignoring these rules) is going to begin on July 15.